Spring is finally here or just around the corner! Warm temperatures will bring children, their families and pets outdoors to enjoy green spaces in their communities, parks and backyards. Spending time outside is good for you, according to research. 1. Children’s stress levels fall within minutes of seeing green spaces. Knowing and experiencing nature makes us generally happier, healthier people. 2. Getting dirty is good for you! Mycobacterium vaccae in soil mirrors the effect on neurons that Prozac provides. 3. Residing near living landscapes improves mental health. Research found that people moving to greener areas experiences an immediate improvement in mental health. 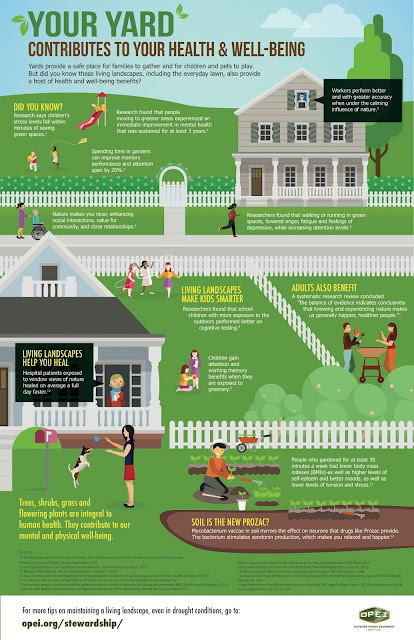 All these points (and there are many more) reinforce the health benefits of our outdoor living spaces. For more tips on maintaining a living landscape, even in drought conditions, please visit www.opei.org/stewardship.